Mapping 1,830 buildings. 127 buildings could not be mapped. 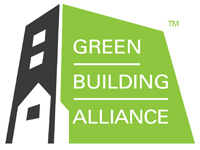 Based in Pittsburgh, Pennsylvania, Green Building Alliance (GBA) inspires the creation of healthy, high performance places for everyone by providing leadership that connects knowledge, transformative ideas, and collaborative action. Established in 1993 and the first U.S. Green Building Council affiliate, GBA is also a USGBC Chapter.